Dubai, UAE, March 21, 2019: If Spring/Summer is your favourite season, then you’re likely ready to discover the latest make-up collections for the new season and be thrilled to experiment more with your looks. So, if you’re keen on shaking up your make-up life and weaving in new products, then Lottie London is the brand to add to your wish list, offering fun and playful products from colourful eye shadows to quirky lip toppers. These iridescent liquid eye shadows will take your eye make-up game to the next level, as they glide on the lids smoothly giving a foil-like glittery effect. The eye foils can be worn on their own or as eye toppers to add a pop of glitter to the centre of the eye lids. The eye foils come in various types of finishes: shimmer, glitter and holographic. Mix and match ultra-metallics, smooth sparkling shimmers and creamy mattes with Lottie London’s Eyeshadow Palettes. Packed with 9 shades designed for every occasion, these compact palettes are perfect for on-the-go glam! This palette comes in 3 options: The Rose Gold, The Mauves and The Rusts. Arch Rival Micro-blade (AED 45): Inspired by micro-bladed brows that are always on fleek, Lottie’s Arch Rival Micro-blade lets you achieve the flawless finish of micro-blading for a fraction of the price. The ultra-fine precision tip allows you to create the smallest of strokes to mimic your natural brow hairs for a straight-from-the-salon look. This product is also long wearing, so you can party all day long without worrying about fading or smudging. These iridescent and metallic lip foils can be worn as lip toppers over any lipstick and will instantly transform your make-up looks. The lip foils have a sheer finish and come in a variety of colours from pinks and golds to quirky greens and blues. 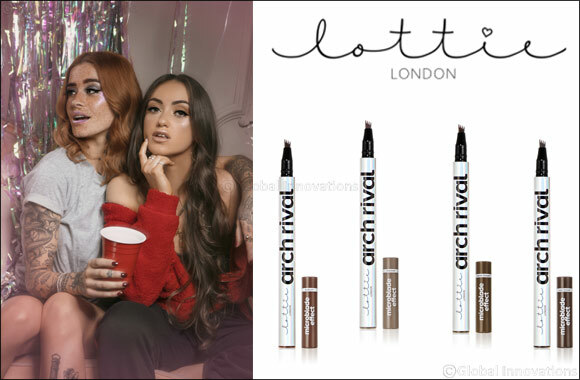 Lottie London’s new make-up is available for purchase at Virgin Megastores and online on Namshi.com and Beautysolutions-me.com.